I made a new world called "Fun With Redstone". I had a "genius" idea to make a zombie killing mini-game, so I put in the super fast redstone clock /kill @e[Type=Zombie] and shortly after, realized my blunder. My world is now stuck in a death loop where every time I respawn I just get killed again. Can anyone help me to get out of that loop? Maybe there are hidden files or something? I don't wanna reset my whole world, since there are other projects there. If you don't want to use MCEdit, you can still use NBT Explorer. Download it here. Now, open it up and select your world. Then, you want to click on Search->Find. Tick the value box and enter your command or just a part of it. 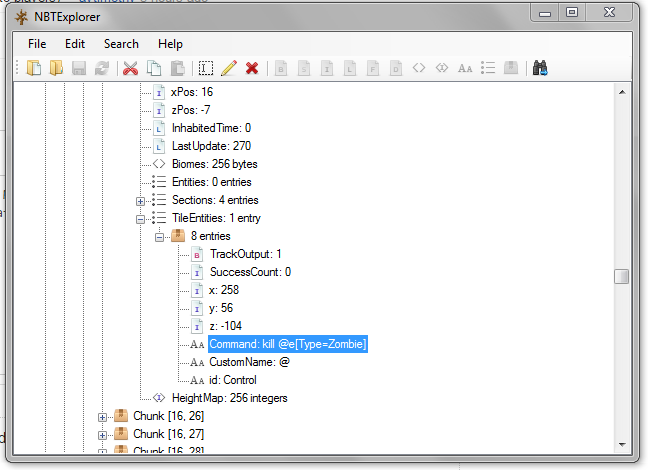 After a short amount of time, NBTExplorer will have found the problem causing command block. So now you can easily edit the command by double clicking on it. Make sure to click on the save button at the top, to ensure your changes got saved and you're done. Use MCEdit to delete the command block or to break the redstone. Alternatively if you are fast enough you may be able to run a command before you die. You can fix this without mods or external editors. A feature of the standalone Minecraft server is that it has a configuration option to disable command blocks. We can exploit this to save your game. Run the server once to make sure it's working, and that you can connect to it. Then stop the server. 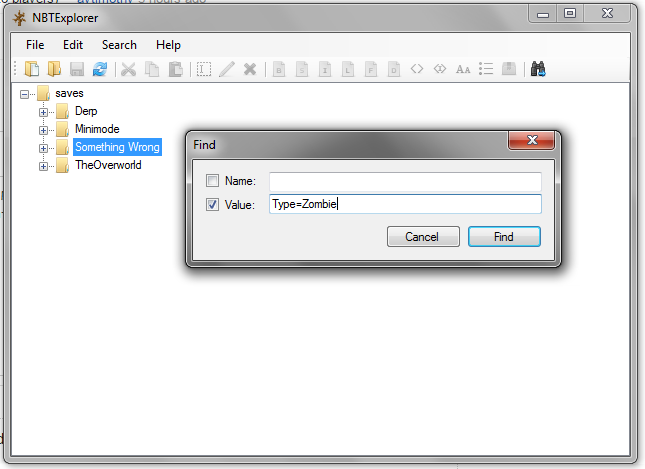 Delete the contents of the server's world folder and replace it with a copy of the contents of your affected save folder. Run the server and connect. Go find your errant command block and fix it or disable its clock. Wait a minute to make sure an auto-save happens, or just issue the save-all command in the server console. Stop the server again. Play singleplayer and confirm that you don't die instantly anymore! 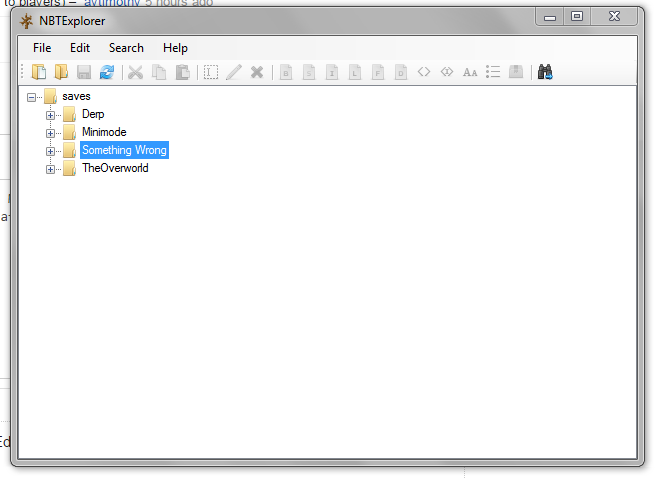 If it is by any chance on a server, go to your server properties folder and disable command blocks. After that, get back on your world and destroy the command block that is keeping you in the loop. Once finished, close your server and turn command blocks back on. Once you finished, it should be back to normal. I got an way to fix it without anything like world edit. 7.The command block has the repeat on but it erased the command so delete the command block. Then go to settings, controls and set the "destroy block" (or something) control from button 1 (left-click) to Enter. Now press Ctrl + V and press Enter twice ASAP. Ta-da! Tip: having trouble with the three keys? Use an AutoTyper program and press the type key. Now it's reduced to two keys to press in an tick. And yes, pressing three keys in a tick is possible. You might want to use some hacks if you are still having trouble with two keys. (AutoRespawn or something...?) Also, if this is Multiplayer, simply turn Command Blocks off in the menu thing. How do I get rid of a large number of Ender Dragons? I can't break a redstone clock that keeps killing me? How can I get redstone working again?